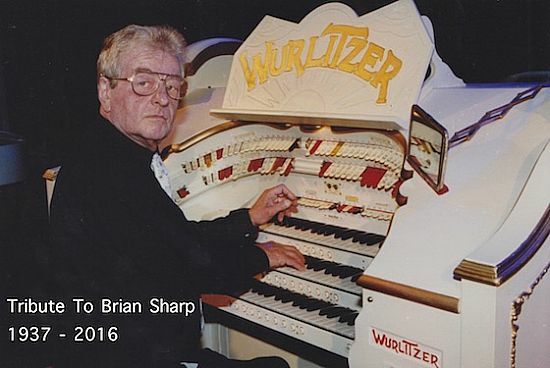 Brian Sharp sadly passed away on 20th January 2016 at the age of 78 after a battle with cancer. He was a gifted organist - keyboard player who inspired many young players, while giving pleasure to millions of music lovers on stage, TV screen and radio. In the 70's Brian was regularly featured on the Charlie Chester radio show and the BBC TV Pebble Mill at One programme. In 1980 Brian had star billing at Britain's first Electronic Organ Festival held at a Pontin's holiday site at Torquay and the many festivals that followed, several with over 2,000 keyboard enthusiasts. Also in the 80's and 90's, Brian entertained thousands of holiday makers at the Sandford Park Holiday Village at Poole in Dorset, playing the Christie pipe organ he loved, combining the sound with electronic keyboards. Brian had a style of his own, producing magical arrangements that no-one has yet quite matched. On this website other players and producers are given the opportunity to pay a tribute in their own words to a master player who will be long remembered, with his music living on through his many recordings he made over the years. After a private family funeral, the family have expressed a wish for privacy at this time. A memorial service will be arranged at a later date.. The administrators of this website are not responsible for any advertisements put on by the hosting service and do not endorse them in any way whatsoever. The data on this website is in the public domain and has been collated in good faith in order to highlight someone who deserves to be remembered for a lifetime with music. Personal and family details are not included as a mark of respect. No responsibility is accepted for any errors, omissions, the content of the Guestbook or any linked third party websites. Format and design are copyright and all rights are reserved - January 2016.